CARLY FIORINA IS A PASSIONATE, ARTICULATE ADVOCATE FOR CONSERVATIVE POLICIES THAT ADVANCE ECONOMIC GROWTH, ENTREPRENEURSHIP, INNOVATION, AND EFFECTIVE LEADERSHIP. When Carly was recruited to Hewlett Packard, she became the first woman to lead a Fortune 50 business, taking HP from the 28th to the 11th most profitable company in the US. In her six years as Chairman and CEO of HP, she would double its revenues to $90 billion; more than quadruple its growth to 9%; triple the rate of innovation to 11 patents a day; achieve market leadership in every market and product category and quadruple cash-flow. She would promote herself as a conservative and successful business leader. She has no respect for environmentalists. She disbelieves global climate change. She maintains Indiana’s religious liberty law is fair-minded. She would roll back federal regulations that place an undue burden on small businesses. She favors reductions in federal tax rates. At CPAC, she focused her remarks on attacking Hillary Clinton. Fiorina, with no experience in elective office, has little chance of winning the GOP nomination; her one chance being that the GOP would conclude that only a woman would stand a chance of defeating HRC. This entry was posted in 2016, Economics, Environmental, fracking, Political, President, pro-life/pro-choice and tagged Carly Fiorina, Climate Change, GOP war on women. Bookmark the permalink. Blaming “environmentalists” for water shortages is like blaming cops for crime. She seems to think the drought has little to do with an unusual lack of precipitation and much to do with a lack of foresight in constructing waterworks. This view would be less surprising if she weren’t also a climate change denier. if California would build more desalination plants they would have all the water they could ever use. But no, it costs too much and would mean the people in California would have to pay as much, for their water, as we do in the Northeast. Carly Fiorina decries “identity politics,” which are political arguments that focus upon the interest and perspectives of groups with which people identify such as social class, race, gender, sexual orientation, age, and ethnicity. This is a cleaned up version of MItt Romney’s allegation that Democrat’s political views are aimed at the half of us whom he called “takers.” Thus Fiorina denies that working class or middle class interests differ from upper class interests–one size fits all. A 650-year period of frequent droughts plagued the area from about 500 to 1150, they found. This dry period was part of a period of droughts in Mexico’s highlands that lasted from about 200 B.C. until the year 1300, just before the Aztec empire took power. OH no, climate change in 200 BC, damn Aztecs, it’s their fault. Bob’s argument–if there ever was a drought anywhere, no drought can ever be a cause for alarm–is simple but false. Bob. Good article. It demonstrates that we need to look to experts for our information, not Fox News or politicians or the fossil fuel industry. I am glad that you are learning that climate change does cause real problems for real people. That is a good first step. Unlike the ancient Mesoamerican civilizations we are fortunate that we understand these processes today. Sacrificing warriors and praying to gods doesn’t work, does it? Real problems need real scientifically based solutions. Hang in there. You are learning. Alas, Sarah Palin, Rep. Marsha Blackburn, and Rep. Michele Bachmann and unfortunately many others, have taken the Republican brand to new lows for women. Ms. Fiorina is no exception. During the 2010 California Senatorial race between she and Sen. Barbara Boxer, Fiorina’s only knowledge about foreign affairs was one trip to ( where else?) Israel. Fiorina’s main claim to fame during that race was her comment on Boxer’s hair-do being “so yesterday”. 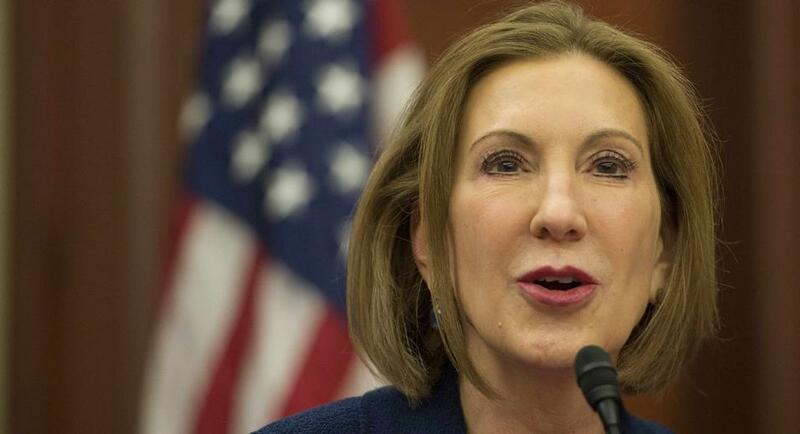 Ms. Fiorina is not ready for prime time, let alone a run for the Presidency. YEP, AND IT HAS ALL HAPPENED BEFORE, NATURALLY. If the planet hadn’t warmed man probably wouldn’t exist. Without man putting to use the resources, of the earth, he would have gone extinct, long ago. Where would man be without FIRE ? A key word in the study of ecology is “balance”. When an ecosystem gets out of balance the system drastically changes. The bigger storms, droughts, fires, extreme snow and snow are signs that the Earth’s Ecosystem is out of balance. Grasses and flowers blooming earlier in the Arctic also shows that systems are out of balance. We now have the ability to limit the causes of Carbon Dioxide, but that would affect the bottom-line of the corporations running (or ruining) this country. You got me on that one Bob. When it comes to being irrelevant I defer to your comments.